Devpost, Inc. (“Devpost”) will provide the Hackathon Website and will be the official timekeeper for the Hackathon. Organizations (including corporations, not-for-profit corporations and other nonprofit organizations, limited liability companies, partnerships, and other legal entities) that exist and have been organized or incorporated at the time of entry. An Eligible Individual may join more than one Team or Organization and an Eligible Individual who is part of a Team or Organization may also enter the Hackathon on an individual basis. If a Team or Organization is entering the Hackathon, they must appoint and authorize one individual (the “Representative”) to represent, act, and enter a Submission, on their behalf. The Representative must meet the eligibility requirements above. By entering a Submission on the Site on behalf of a Team or Organization you represent and warrant that you are the Representative authorized to act on behalf of your Team or Organization. PLEASE NOTE: It is your sole responsibility to review and understand your employer’s policies regarding your eligibility to participate in trade promotions, including this Hackathon. If you are participating in violation of your employer’s policies, you may be disqualified from entering or receiving prizes. Poster and Administrator disclaim any and all liability or responsibility for disputes arising between an employee and their employer related to this matter, and prizes will only be awarded in compliance with the employer’s policies. Register your application with Azure AD for Graph access. Fill the form to record your option of whether you are using pre-built data or building your own data and share your application ID with us. Use the Microsoft Graph Security API. Your solution must use the Microsoft Graph security/alerts or security/securescore entities. (i) What to Create: Makers must build or update a functioning Microsoft Graph-powered solution that leverages the Microsoft Graph Security API. Your solution must use the Microsoft Graph security/alerts or security/securescore entities, and those solutions that incorporate use of other Graph services (users, groups, mail, messages, etc.) will get credit while judging. (ii) Functionality: An Application must be capable of being successfully installed and running consistently on the platform for which it is intended, and must function as depicted in the video and/or expressed in the text description. (iv) New and Existing: Applications must be either newly created by the Maker or, if the Application existed prior to the Hackathon Submission Period, must have been updated after the start of the Hackathon Submission Period. Provide a way to access your project for judging and testing, including a link to your repo hosting the application’s code, and any other deployment files and instructions needed. This can be on a code repository service, an attached file, or a shared folder.  If your share or repository is private, share access with graphsecurityhack@microsoft.com. Ensure your code compiles fine and works as expected before sharing! (vii) Public Distribution: The Maker may make the Application available to the public via a website or online store, but is not required to do so prior to the end of the Hackathon Submission Period. (ix) Multiple Submissions: A Maker may submit more than one Submission, however, each Submission must be unique and substantially different from each of the Maker’s other Submissions, as determined by the Poster and/or the Administrator. (i) Text Description: The text description should explain the features and functionality of your Application and describe how the Application could help users increase their productivity. e) must not include third party trademarks, or copyrighted music or other material unless the Maker has permission to use such material. B. Poster Rights: By entering the Hackathon, you grant to the Poster, Administrator, and any other third parties acting on the Poster’s behalf, a royalty-free, non-exclusive, worldwide perpetual license to display publicly and use for promotional purposes the Submission, in perpetuity. This license includes, but is not limited to, the marketing, sale or promotion of on Poster’s, Administrator’s, and partners’ products or services, posting or linking to the Submission on Poster’s, Administrator’s, and partners’ websites and applications, including the Hackathon Website, and display and promotion of the Submission in any other media, worldwide. By entering you acknowledge that the Poster, Administrator or partner may have developed or commissioned materials similar or identical to your Submission and you waive any claims resulting from any similarities to your entry. Further you understand that the Poster, Administrator or partner will not restrict work assignments of representatives who have had access to your Submission and you agree that use of information in their representatives’ unaided memories in the development or deployment of their products or services does not create liability for us under this agreement or copyright or trade secret law. Your Submission may be posted on a public website. The Poster, Administrator or partner are not responsible for any unauthorized use of your Submission by visitors to this website. The Poster, Administrator or partner are not obligated to use your Submission for any purpose, even if it has been selected as a winning Submission. B. Required Forms: Potential winners will be notified using the email address associated with the Devpost account used to enter the Submission (the submitter is the “Representative” in the case of a Team or Organization). In order to receive a Prize, the potential winner (including all participating team members in the case of a Team or Organization) will be required to sign and return to the Poster or Administrator, affidavit(s) of eligibility (or a similar verification document) and liability/publicity release(s), and any applicable tax forms (“Required Forms”). B. Prize Delivery: Prizes will be payable to the Maker, if an individual, to the Maker’s Representative, if a Team or Organization, if the Maker is an Organization. It will be the responsibility of the winning Maker’s Representative to allocate the Prize among their Team or Organization’s participating members, as the Representative deems appropriate. A monetary Prize will be mailed to the winning Maker’s address (if an individual) or the Representative’s address (if a Team or Organization), or wired to the Maker, Maker Representative, or Organization’s bank account, only after receipt of the Required Forms. The duration of your consent is for a period of three years following the conclusion of the Hackathon. This consent applies, as applicable, to all members a Maker’s Team, or Organization that participated in the winning Submission.